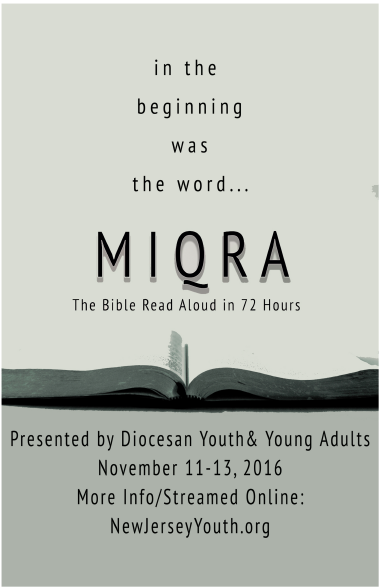 Fall Youth Event MIQRA (Reading the Bible in 72 Hours) When: November 11-13, 2016 Where: Camp Lebanon, Lebanon, NJ Begin: Reading begins on November 10th – Ends: November 13, 2016 Who: 6th through Young Adults and their Chaperones Cost: $75 per person MIQRA (meek • rah) is a weekend retreat that focuses on the Bible and allows teens to discover its content, why we should care, and how to read it. Why do we have this event? The Bible is important to the Christian faith, but many Christians may not know its content and may find it difficult to read, or may not know how it’s relevant to their life. This event offers teens a chance to come together, make friends, ask questions, and learn about God’s love letter to the world. What’s with the name? “MIQRA” is a Hebrew word, which means “reading,” and refers to the ancient Jewish practice of gathering at the local synagogue to hear a public reading of scripture. Is the Bible read out loud at MIQRA? Yes! We read the entire Bible from Genesis to Revelation in 72 hours! The reading is voluntary and participants take turns reading in shifts around the clock. What else happens along with the reading? So many fun things happen at MIQRA! We’ll play wacky games around the church. We’ll have a movie night. We will worship with fun and lively music. Participants will engage in workshops on various biblical topics and hear clergy speak about the bible. At times, attendees will gather in small groups to make friends and talk about their Bible discoveries.